In this walkthrough, you create a Silverlight Business Application that displays data from the AdventureWorks sample database on two different Silverlight pages. 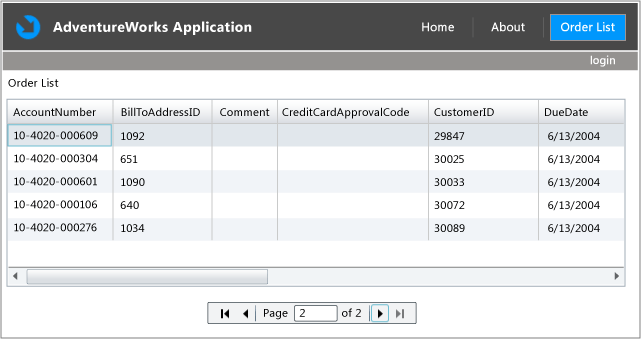 The first page displays data from the SalesOrderHeader table and provides support to page through the database records. The second page allows the user to execute a query based on a date. Creating a Silverlight Business Application that consists of two projects: a Silverlight client and an ASP.NET Web Application. Changing the application name by modifying a resource string. Creating an entity data model based on a database file. 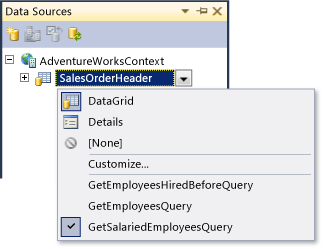 Creating a domain service that exposes the data in the entity data model to the Silverlight client. For more information, see Domain Services. Modifying and adding custom queries to the domain service. Creating additional Silverlight pages to present data to users. Adding buttons to the default navigation bar to access the Silverlight pages. Configuring the Silverlight pages to display data by dragging items from the Data Sources window to the Silverlight Designer. Sorting and paging of the data. Configuring a user interface to take query parameters. This walkthrough assumes that you can create a Silverlight Business Application. The procedure for completing this task is described in the Walkthrough: Using the Silverlight Business Application Template. Silverlight Business Applications are solutions with two projects: a Silverlight application and an ASP.NET Web Application that hosts the Silverlight application. Silverlight Business Applications have built-in functionality. By default, they have a Home page, an About page, a navigation bar, and site registration functionality. A default application name is also provided as a resource string that you change to your applications name. In Visual Studio 2010, create a new Silverlight Business Application project in Visual Basic or C# named AdventureWorksApp. The procedure for completing this task is described in the Walkthrough: Using the Silverlight Business Application Template. The AdventureWorksApp solution is created with two projects: an AdventureWorksApp Silverlight project and an AdventureWorksApp.Web Web application project. In Solution Explorer, expand the AdventureWorksApp project. Expand the Assets folder and then expand Resources. Double-click ApplicationStrings.resx to open the Resource Designer. Change the ApplicationName resource string Value to Adventure Works Application. Save the changes and close the ApplicationStrings.resx file. The home page opens and displays the default design, which includes the updated application name. To manage the data in the application, you use an entity data model. In Solution Explorer, right-click AdventureWorksApp.Web, click Add, and then click New Item. 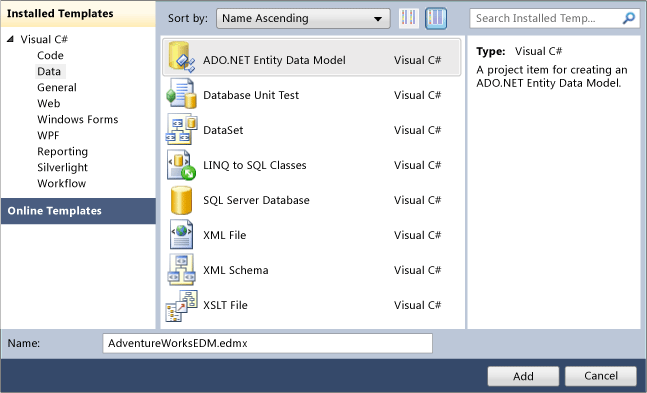 In the Data category, click the ADO.NET Entity Data Model template. Change the name to AdventureWorksEDM.edmx, and then click Add. On the Choose Model Contents page, click Generate from database and then click Next. On the Choose Your Data Connection page, click New Connection. The Connection Properties dialog box appears. Select Microsoft SQL Server Database File for the data source and specify the location of the AdventureWorksLT database file. If a message appears asking you if you want to copy the database file to your project and modify the connection, click Yes. Add a check mark next to the SalesOrderHeader (Sales LT) table. The SalesOrderHeader table appears in the Entity Designer. You must build the solution prior to adding a domain service. A domain service exposes the data entities and operations in the data model to the client. In this procedure, you add a domain service to the server project. In the Web category, click the Domain Service Class template. 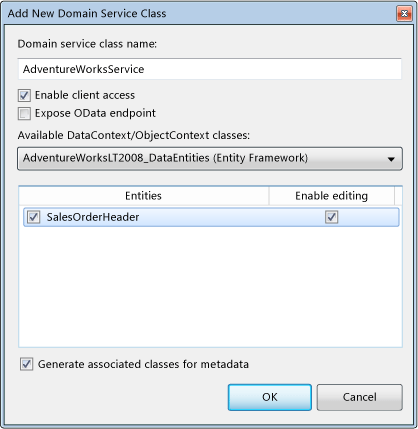 Name the Domain Service Class AdventureWorksService and then click Add. The Add New Domain Service Class dialog box opens. Select the SalesOrderHeader and Enable editing check boxes, and then click OK. When you add a domain service class, it comes populated with query methods. You may decide to use these query methods without further modification. However, in many cases, some modification is necessary. In this procedure you edit the GetSalesOrderHeaders query method. In Solution Explorer, double-click AdventureWorksService.vb or AdventureWorksService.cs to open this file. Update the GetSalesOrderHeaders method as shown in the following code. In this procedure, you add an OrderList page to display the data from the SalesOrderHeader table. In Solution Explorer, in the AdventureWorksApp project, right-click the Views folder and add a new item. In the Add New Item dialog box, select the Silverlight category and then click the Silverlight Page template. Change the name to OrderList.xaml, and then click Add. OrderList.xaml opens in the designer. From the Toolbox, drag a TextBlock to the top of the designer. In the Properties window, change the Text property to Order List. In this procedure, you add a button to the application's home page that navigates to the OrderList page. In Solution Explorer, double-click MainPage.xaml to open it in the designer. In XAML view, add the following markup after the <HyperlinkButton x:Name="Link2" ... /> line. The Order List button should appear in the navigation bar. Click the Order List button. In this procedure, you create and configure a DataGrid to display order data by dragging an order entity from the Data Sources window to the designer. In Solution Explorer, double-click OrderList.xaml. Click the Data menu and then click Show Data Sources. The Data Sources window opens. Notice that the Data Sources window already contains the entities available to the application. From the Data Sources window, drag the SalesOrderHeader node to the designer (below the Order List text block). A DataGrid populated with column headings from the SalesOrderHeader table appears on the design surface. In the navigation bar, click the Order List button. Order data displays on the Order List page. You can create additional queries in the domain service. This procedure adds two custom queries. In Solution Explorer, double-click AdventureWorksService.vb or AdventureWorksService.cs. If you are using Visual Basic, at the top of the AdventureWorksService.vb file, set the Option Strict statement to Off. In this procedure, you display the data from the new query by selecting the query in the Data Sources window and dragging it to the DataGrid that is already on the designer. This action reconfigures the binding of the DataGrid to display data from the selected query. In the Data Sources window, click SalesOrderHeader and then click the drop-down menu. Notice the three queries listed at the bottom of the menu. The checked query is the query that will be set in the QueryName of the generated data source after dragging this entity to the designer. Select GetOrdersWithSmallSubtotalsQuery from the list of queries to set it as the query of this entity. Drag the SalesOrderHeader node to the existing DataGrid on the designer. Note that no order subtotal listed in the DataGrid exceeds 2000. In addition to sorting data by using the OrderBy clause in the underlying queries, you can also configure sorting in the XAML of your page. You configure sorting by adding SortDescriptors to the DomainDataSource. You can add SortDescriptors directly in the XAML, or by using the Properties window, as shown in the following procedure. In Solution Explorer double-click OrderList.xaml. In XAML view, position your cursor in the riaControls:DomainDataSource element whose Name attribute is set to salesOrderHeaderDomainDataSource1. There are two riaControls:DomainDataSource elements in the file. Be sure to place your mouse in the element whose Name attribute is set to salesOrderHeaderDomainDataSource1. In the Properties window, click the SortDescriptors property and then click the ellipsis button (…). The SortDescriptors collection editor appears. A SortDescriptors item is added. Under Properties, expand the Other category. In the PropertyPath value column, type CustomerID. Note the data is sorted by list Customer ID. When you implement paging and sorting together, include at least one SortDescriptor with its PropertyPath attribute assigned to a property that contains unique values, such as a primary key. Or add an OrderBy clause based on a property that contains unique values to the query in the DomainDataSource. If you only sort the data on a property that does not contain unique values, the return values could contain inconsistent or missing data across pages. In this procedure, you add paging by adding a DataPager to the data source. You set the DataPager.Source to the DomainDataSource that manages the data the pager should control. In the ToolBox, locate the DataPager control. Drag the DataPager to an area in the designer below the DataGrid. In the Data Sources window, click the SalesOrderHeader node, click the drop-down menu, and verify the GetOrdersWithSmallSubtotalsQuery is selected. Drag the SalesOrderHeader node onto the DataPager. This sets the DataPager's Source property to the correct data source. Select the DataPager on the designer. In the Properties window, set the PageSize property to 5. Click the navigation buttons on the DataPager to navigate 5 records at a time in the DataGrid. Previously in this walkthrough, you added a custom query to the domain service that returns orders with a ship date before a user-supplied date. This procedure demonstrates how the Data Sources window can be used to create a user interface that takes user-supplied parameters that are then passed to a domain service query. In the AdventureWorksApp project, in the Views folder, add a new Silverlight Page named OrderSearchByShipDateBefore.xaml. In Solution Explorer, double-click MainPage.xaml. In XAML view, add the following code after the <HyperlinkButton x:Name="Link3" ... /> line. In Solution Explorer, double-click OrderSearchByShipDateBefore.xaml. 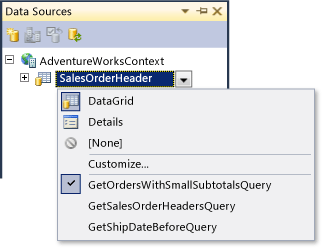 In the Data Sources window, click the SalesOrderHeader node and then click the drop-down menu. Select GetShipDateBeforeQuery to set it as the query of this entity. Drag the SalesOrderHeader node to the designer. 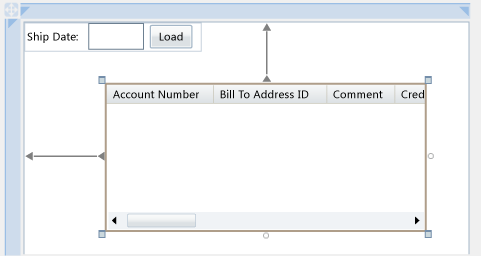 In addition to the DataGrid, a text box is created to accept the parameter in the query, and a button is added to run the query and load the data. In this procedure, you build and run the application to verify that the application behaves as expected. Verify that the solution builds without errors. Click the Ship Date button to open the page with the ship date query. In the Ship Date box, type a date, such as 1/1/2006. Note that only ship dates before the specified date are returned. Learn how to modify records and save changes back to the database. For more information, see Walkthrough: Editing Data From a Domain Service.